Heat oven to 350&deg;F (180&deg;C) for shiny metal or glass pans or 325&deg;F (160&deg;C) for dark or non-stick pans. Grease bottoms and sides of three 9-inch (23 cm) round baking pans of checkerboard cake set with shortening; lightly flour. Place divider ring in one of the pans, following manufacturer's directions. In medium bowl, beat cake mix, milk, cream cheese, vanilla and eggs with electric mixer on low speed 1 minute, scraping bowl constantly. Beat 2 minutes longer. Divide batter in half; stir cocoa into half of batter. Spoon batter into pan with divider ring, following manufacturer's directions. Repeat for each cake layer. Bake 35 to 40 minutes or until toothpick inserted in center comes out clean. Cool 10 minutes; loosen side of cake from pans with metal spatula; turn upside down onto cooling rack. Remove pans. Cool completely, about 1 hour. Using a thin layer of frosting between layers, stack cake layers so outside colors of cake alternate. Place cake on serving plate; frost side and top of cake with frosting. 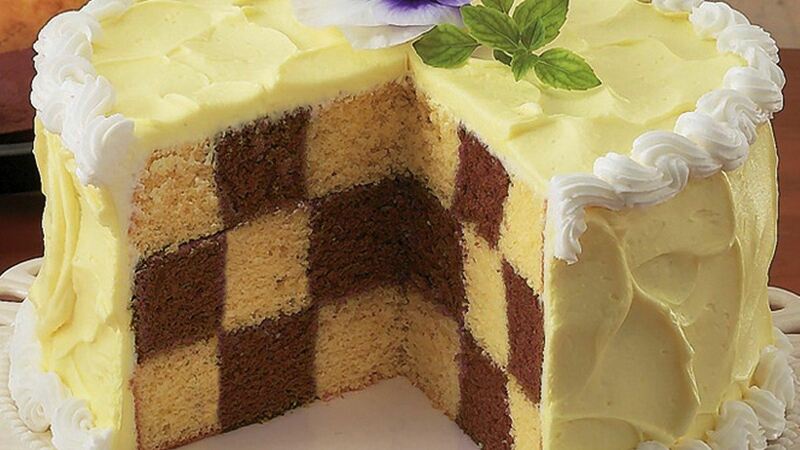 Tip: Look for the checkerboard cake pan set at specialty cookware stores.